Patrick Keegan was farewelled last week by the school communities who he helped influence. 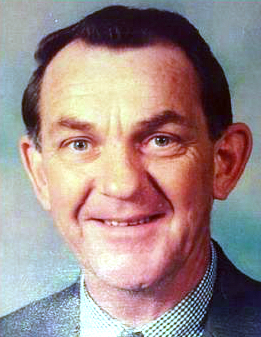 Patrick was a teacher at Bankstown De La Salle College and then LaSalle Catholic College for 29 years. He was greatly respected and liked by staff and students and was regularly visited by former students. This was also confirmed by the number of former who attended his funeral. "His teaching method was both effective and unique. He spent much of his spare time dedicating his knowledge to his students, caring that they understood and were able to apply the knowledge they gained in his lessons. The conventional black board was Mr Keegan's token teaching utensil, the straightness of his handwriting was astonishing! Students were absolutely silent in his classes, constantly surveyed by his glassy stare. His classes were always animated, humorous and successful. " David Luschwitz Yr 12 ex-student 2003.